American politician, Senator 1949-1961, Vice President 1960-1963, President 1963-1969; huge supporter of civilian space flight, instrumental in creating NASA, and providing the political and budgetary support for the Apollo moon landing program. Lyndon B. Johnson (D-TX) was elected to the House of Representatives in 1937 and served until 1949. He was a senator from 1949-1961, vice president of the U.S. from 1960-1963, and president from then until 1969. Best known for the social legislation he passed during his presidency and for his escalation of the war in Vietnam, he was also highly instrumental in revising and passing the legislation that created NASA and in supporting the U.S. space program as chairman of the Committee on Aeronautical and Space Sciences and of the preparedness subcommittee of the Senate Armed Services Committee, then later as chairman of the National Aeronautics and Space Council when he was vice president. Country: USA. Bibliography: 535, 5577. 1908 August 27 - . Birth of Lyndon B Johnson. - . Related Persons: Johnson, Lyndon. American politician, Senator 1949-1961, Vice President 1960-1963, President 1963-1969; huge supporter of civilian space flight, instrumental in creating NASA, and providing the political and budgetary support for the Apollo moon landing program..
1961 April 25 - . Vice President Johnson made head of the National Aeronautics and Space Council. - . Nation: USA. Related Persons: Johnson, Lyndon, Kennedy. President Kennedy signed legislation making the Vice President of the United States the presiding officer of the National Aeronautics and Space Council..
1962 March 13 - . Apollo program to be given DX priority - . Nation: USA. Related Persons: Johnson, Lyndon, Kennedy, Webb. Program: Apollo. Spacecraft: Apollo CSM. James E. Webb, NASA Administrator, recommended to President John F. Kennedy that the Apollo program be given DX priority (highest priority in the procurement of critical materials). He also sent a memorandum to Vice President Lyndon B. Johnson, Chairman of the National Aeronautics and Space Council, requesting that the Council consider advising the President to add the Apollo program to the DX priority list. 1962 April 21 - . Titov tour - . Nation: Russia. Related Persons: Johnson, Lyndon, Titov. Titov is to go to New York, San Francisco, Seattle, and meet Vice President Lyndon Johnson. He is to head back on 1 May..
1962 May 3 - . Titov meets Glenn - . Nation: Russia. Related Persons: Glenn, Johnson, Lyndon, Kennedy, Titov. Spacecraft: Mercury. They view the Redstone and Atlas rockets and a Mercury space capsule. Kamanin finds the Mercury very cramped, but notes that it is equipped with all the necessities. Glenn tells him it was possible for the astronaut to wear a parachute, but Glenn chose not to - he didn't believe he could really use it in an emergency anyway. Afterwards they were introduced to President Kennedy and Vice-President Johnson. Mercury MA-7 Delta 7 (cancelled) - . Call Sign: Delta 7. Crew: Slayton. Backup Crew: Schirra. Payload: Mercury SC18. Nation: USA. Related Persons: Johnson, Lyndon, McNamara. Flight: Mercury MA-7 Delta 7. Spacecraft: Mercury. Astronaut Deke Slayton was to have been the second American in orbit. On March 16, 1962, it was announced that Slayton was grounded - due to a minor heart fibrillation known to NASA when they selected him to be an astronaut. Slayton's three orbit flight would have been called Delta 7. Instead Carpenter was selected for the mission, and Schirra, Slayton's backup, was moved to the Mercury 8 flight. 1963 November 22 - . President Kennedy killed; Lyndon B. Johnson becomes President - . Nation: USA. Related Persons: Johnson, Lyndon, Kennedy. President Kennedy shot and killed by sniper in Dallas, Tex. Lyndon B. Johnson becomes President same day . 1963 November 28 - . John F Kennedy Space Center (KSC) named - . Nation: USA. Related Persons: Johnson, Lyndon, Kennedy. Program: Apollo. In honor of the late President John F. Kennedy, who was assassinated six days earlier, President Lyndon B. Johnson announced that LOC and Station No. 1 of the Atlantic Missile Range would be designated the John F. Kennedy Space Center (KSC), ". . . to honor his memory, and the future of the works he started . . . ," Johnson said. On the following day, he signed an executive order making this change official. With the concurrence of Florida Governor Farris Bryant, he also changed the name of Cape Canaveral to Cape Kennedy. 1964 October 1 - . Sixth anniversary of NASA - . Nation: USA. Related Persons: Johnson, Lyndon, Webb. Program: Apollo. Ceremonies in Washington marked the sixth anniversary of the National Aeronautics and Space Administration (NASA). Administrator James E. Webb reminded those present of NASA's unique contribution to America's mission and destiny, then read a message from President Johnson: "We must be first in space and in aeronautics," the President said, "to maintain first place on earth. . . . Significant as our success has been, it is but indicative of the far greater advances that mankind can expect from our aeronautical and space efforts in the coming years. We have reached a new threshold . . . which opens to us the widest possibilities for the future." Two days later, in an address in White Sulphur Springs, W. Va., Webb observed that "as the national space program moves into its seventh year, the United States has reached the half-way point in the broad-based accelerated program for the present decade." America was halfway to the moon. 1964 December 7 - . Recommendation that the Air Force's MOL and NASA's Apollo X programs be merged. - . Nation: USA. Related Persons: Johnson, Lyndon. Spacecraft: Apollo X, MOL. 1965 August 25 - . Manned Orbiting Laboratory (MOL). - . Nation: USA. Related Persons: Johnson, Lyndon. Spacecraft: MOL. 1965 August 25 - . Launch Site: Vandenberg. Launch Complex: Vandenberg. LV Family: Titan. Launch Vehicle: Titan 3M. MOL to be launched from Canaveral and Vandenberg - . Nation: USA. Related Persons: Johnson, Lyndon. Class: Manned. Type: Manned space station. Spacecraft: MOL. DoD revealed that newly-authorized Manned Orbiting Laboratory (MOL) program (announced by President Lyndon Johnson the same day) would be launched from both the Air Force Eastern and Western Test Ranges..
1968 December 4 - . Soviets judge that Apollo 8 has only a 25% chance of success. - . Nation: Russia. Related Persons: Johnson, Lyndon. Program: Apollo. Flight: Apollo 8, Soyuz 7K-L1 mission 1. The State Commission investigating Gagarin's crash publishes it report. It found that pilot error put the aircraft into a critical situation. Kamanin judges that the Apollo 8 mission is only being flown to give US President Lyndon Johnson a triumph before he leaves office. He judges the mission has only a 25% chance of success. 1973 January 22 - . Posthumous tribute to the Apollo program from former President Johnson - . Nation: USA. Related Persons: Johnson, Lyndon. Program: Apollo. 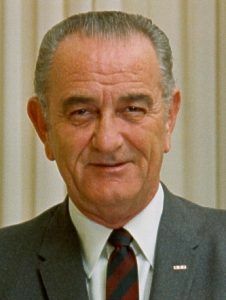 Former President Lyndon B. Johnson - who as Senator had drafted the National Aeronautical and Space Act of 1958 establishing NASA and as Vice President had chaired the National Aeronautics and Space Council at the time of the U.S. decision to land a man on the moon - died of a heart attack in Austin, Tex., at the age of 64. A letter Johnson had sent was read at the National Space Club's "Salute to Apollo" in Washington, D.C., in the evening. Johnson commended the "space pioneers who have made the Apollo miracle a living reality." He said: "It has been more, so much more than an amazing adventure into the unexplored and the unknown. The Apollo Program . . . will endure as a monument to many things, to the personal courage of some of the finest men our nation has ever produced, to the technological and managerial capability which is the genius of our system and to a successful cooperation among nations which has proved to us all what can be done when we work together with our eyes on a glorious goal. "I rate Apollo as one of the real wonders of the world and I am proud that my country, through the exercise of great ability and daring leadership, has given it as a legacy to mankind." 1973 February 17 - . The Manned Spacecraft Center renamed the Lyndon B Johnson Space Center. - . Nation: USA. Related Persons: Johnson, Lyndon. Program: Apollo. The Manned Spacecraft Center was renamed the Lyndon B. Johnson Space Center by Public Law 93-8. The late President's interest and support of the space program began while he was Chairman of the Senate Committee on Aeronautical and Space Sciences and continued during his tenure as Vice President and President.